A celebration of moments. In the big scheme of things this is what makes up a life, moment after moment. What gets lost in the shuffle is that we rarely take the time, if ever, to embrace the moments we are living… each one as it happens, one building upon the next. String those moments together, and you have what’s called an experience. Some experiences are bigger than others and they inspire you to remember that life can be special. Just focus on the moments and add them to your story. It’s the chorus of a classic children’s song and from what I witnessed and experienced in a single day – those wheels and that bus – can transport you to a special place, if the passengers are living and loving every moment. 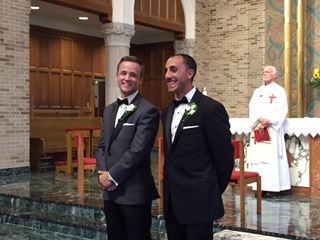 Pete Kohlasch, a great friend and someone I love like a younger brother, got married the other day as myself and about 20 other people got to literally go along for the ride. It’s one we won’t soon forget because it was a ride straight from the heart and into history. A 13-hour-event, nearly five hours of which were spent rolling along on what I call the “Love Bus”. Any wedding, any joining of two souls is a special time, but on this day it was as if the ride to and from the church were as significant events as the ceremony itself, at least in terms of memories we will cherish for a lifetime. 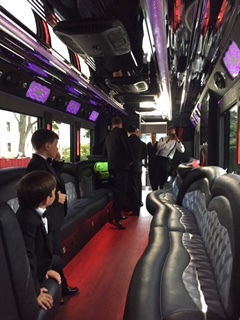 At 2pm on this warm Friday afternoon outside New York City, nine groomsmen, including myself, (and two young ring bearers), boarded a huge coach bus, which made the best limo you ever saw seem like a Yugo. We thought we were going to get picked up in a long stretch, but the bus we boarded stretched our imagination. It was decked out with lights, multiple speakers, crazy winding seats going up and down both sides, a make-shift DJ section, a bar area and enough cup holders to quench the thirst of a small army. 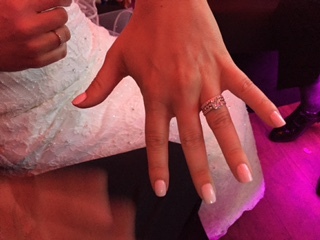 It was the ultimate party bus – one in which you could see it could be easy to get lost – but on this day, with the ultimate destination being a grand moment of love and bonding, you knew you couldn’t take it too far. The wheels on this bus would eventually be headed to a place of God and worship, so you better be ready to be at your best. With the Best Man John Bonacci pumping the tunes from his iPhone, (I mean what else do you need to be a Bus DJ except a smart phone and a USB cord? ), the celebration got underway. 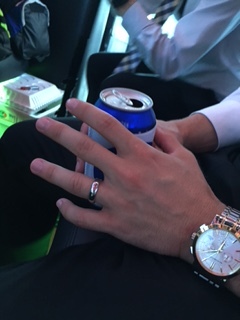 Enough beers (and water, after all it was going to be a long day), to simply get the guys in the right frame of mind, it was time to head to our first stop, to see the bride, Kathleen Galvao. They call it First Look, a chance for the groom to see the bride prior to the wedding, since pictures were planned in the afternoon before the ceremony. 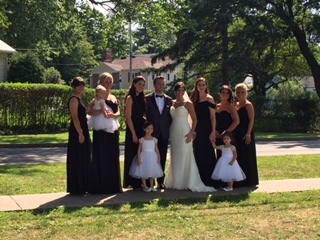 It was like a reality TV show you might call “Fiances”, as the groomsmen, watched from the large bus windows, (and as the music continued to play), as Pete waited by the steps in front of Kathleen’s parents home for his soon-to-be bride to appear. With cameras flashing and digital videos recording the moment, Pete got a look at his beautiful bride for the very first time. 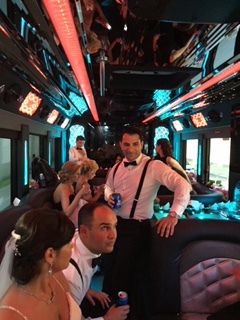 What a moment… but no time to waste, while Pete and Kathleen got into their stretch limo, and this time the bridal party hopped back on the “Love Bus” as well, the wheels on that bus started going ’round again. 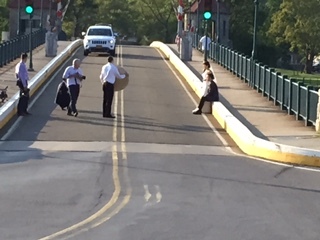 More music, more fun, heading to some location to take pictures with the entire wedding party – though many of us knew not where. And we didn’t care. 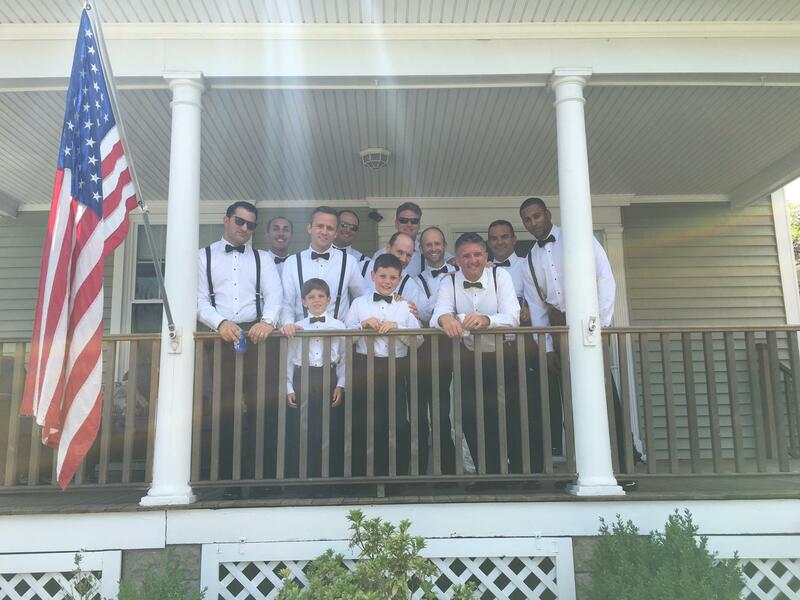 Most of the groomsmen on this bus were childhood friends of Pete’s, along with his cousin, his future brother-in-law, Bubba and Pete’s nephews. Myself, Mark Pallack and Rob Commodari make up the master mind group of which Pete is also a member. Maybe the coolest thing about the ride was the brotherhood bonding among everyone – nothing like music, brews, trash-talk and listening to the stories of the boys and their teenage escapades to keep the ride rolling along. 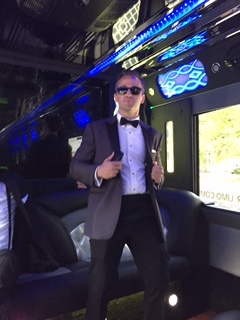 A hot 20-minutes of wedding party picture-taking in our sun-ray-attracting black tuxes and then it was back on the bus and a return trip to the bride’s family home… and snacks!! Much needed, and again nothing like I had ever experienced – when was the last time you got to have a few sandwiches, mac-&-cheese, a spinach ball and a few minutes to rest and relax before the big moment? Everyone was hungry and the stop was welcome, as long as we all got back on the bus and the driver got us to the church on time. With the entire party back on the “Love Bus”, (minus the bride), we traveled the final stretch of road to the church. To say love was in the air is an understatement, to say no one paid attention to how we were getting there is right on the money, after all the party was still in full swing. Even five minutes from the church there was no fear, no anxious nerves for the groom, nothing but joy… everyone following Pete’s lead and his ability to embrace the anticipation of an amazing moment and to let love rule the day. The “Love Bus” pulled up to the church and much to my surprise, almost all the guests were already there! We were the last ones to arrive – instead of being the first ones at the church to anxiously wait around for the big event to begin – we were the big event!!! 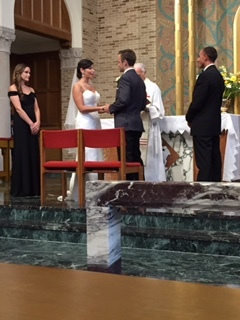 We barely had to wait before the groomsmen escorted the bride’s maids to their pew and and Pete and Best Man Bonacci anticipated Kathleen’s walk down the aisle. 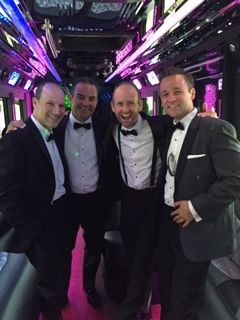 With the ceremony complete and the receiving line exhausted, it was time for the moment we all couldn’t wait for – to get back on the bus!!! This time around something I never expected to happen played out right before my eyes. 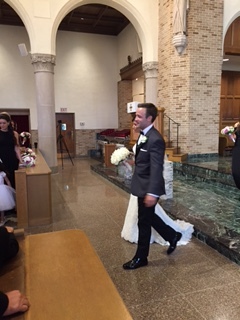 I thought for sure the newlyweds, Mr. & Mrs. Kohlasch, would get into their limo and follow us to the reception. 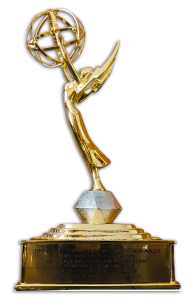 But not to be – the next thing I knew Pete and Kathleen were on the bus! #TeamKohlasch was ready to ride!! 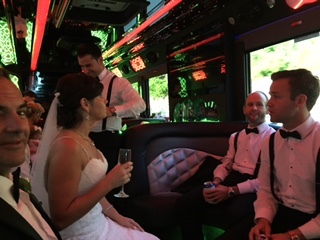 The best part was it was no short trip to the reception – there was plenty of time on the bus for post-ceremony celebrating, and enough love and laughter, (not to mention, music, dancing, and champagne), to power that bus toward our final destination. We even made a stop along the way, and literally stopped traffic, so the wedding photographer, with a keen eye for light and natural beauty, could grab the perfect shot of the bride and groom as the afternoon sun started to dip and the day shortly transformed into night. 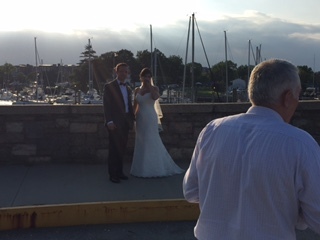 Finally the bus arrived at the reception… a beautiful location overlooking the Long Island Sound. Obviously the story 0f the night doesn’t end here… in fact it continued for another seven hours until we finally arrived back at the hotel at 2am, albeit on a different bus this time… but this tale has pretty much reached the finish line. To say the day was a success would be to put it mildly – it was an over-the-top, overwhelming smash! The ride through the day, through the collection and collaboration of special moments… is one that will stay with me for a long time to come. I’ve never been part of anything quite like it on someone’s wedding day, and I feel fortunate and grateful to have witnessed it all and been a part of history for Pete and Kathleen. In a world that can sometimes be too rigid and planned, this day felt fluid and open-ended, even though I know it had been carefully orchestrated well in advance. The point is if you get the right people together and simply point them in the right direction and let them just be themselves in an atmosphere of friendship and love… magic can and will happen. It certainly did this day, what a ride on the “Love Bus”! 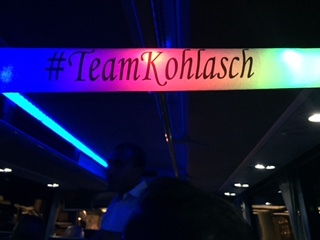 It was my honor and I’m proud to part of #TeamKohlasch.